For Andrea Cerbie ’08, art is about drawing connections between artists and their work. Cerbie was curator for Painterly Perspectives, a recent exhibition in the Williams Center for the Arts gallery. She gave a campus presentation last month on how an artist’s background is expressed in a painting. Guiding students through the exhibit, Cerbie identified Charles Burchfield as one of her favorites. 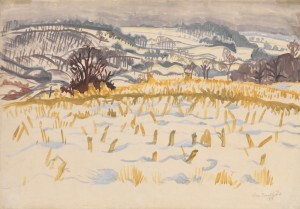 Charles Burchfield, Corn Stubble in Winter (1917, watercolor on paper, 13 x 19 inches), courtesy DC Moore Gallery, New York, with permission from Charles E. Burchfield Foundation. “There is a nostalgic thoughtfulness in his work that is captivating,” she says, pointing to Corn Stubble in Winter and Three Trees on the Road, simple landscapes in a muted palette of haunting watercolors. The exhibit included works from two other estates—Robert De Niro Sr. and Roger Brown—as well as a group of contemporary artists such as Jane Wilson, Eric Aho, and Mark Innerst. As registrar, Cerbie is gatekeeper for works held by the gallery. For each new arrival, she creates an accession record with artist name, location and date of the work’s creation, medium, style, size, condition upon arrival, and special needs for storage or transportation when loaned. She also handles insurance, manages production of the catalogues, and helps facilitate the four or five art fairs in which the gallery participates each year. Taking art studio courses has turned out to be a great benefit even though I knew I would not become an artist. My direct experience with watercolor, oil, acrylic, and other media deepens my expertise as a registrar. An art graduate, Cerbie started out as an economics major but switched after several courses. 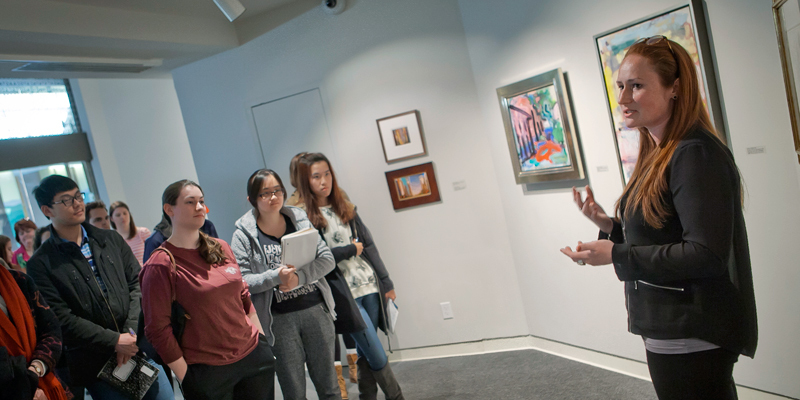 Mattison, Metzgar Professor of Art History, and Ahl, Rothkopf Professor of Art History, continue to be mentors. Mattison, who invited her to curate the show, visited Cerbie at the gallery with his students and alumni during the Celebrate Lafayette in New York events this past November. Cerbie completed internships at Allentown Art Museum and Yard School of Art, Montclair Art Museum, which led to a full-time job as curatorial and registration manager. The internships not only opened doors to future jobs but also gave her experience in many aspects of the art world. She now hires and oversees interns and externs for the gallery, including extern Katie Barrett ’15 in January. Why art? Cerbie says it connects us to fond memories and reminds us of the beauty in life. Painterly Perspective focused on the artist’s connection with his or her subject—in this case, landscapes. Works from DC Moore Gallery artists ranged from the estates of Charles Burchfield, Robert De Niro Sr., and Roger Brown; to well-established artists Jane Wilson and Yvonne Jacquette; to midcareer painters Eric Aho, Mark Innerst, and Darren Waterston; to emerging artist Claire Sherman.